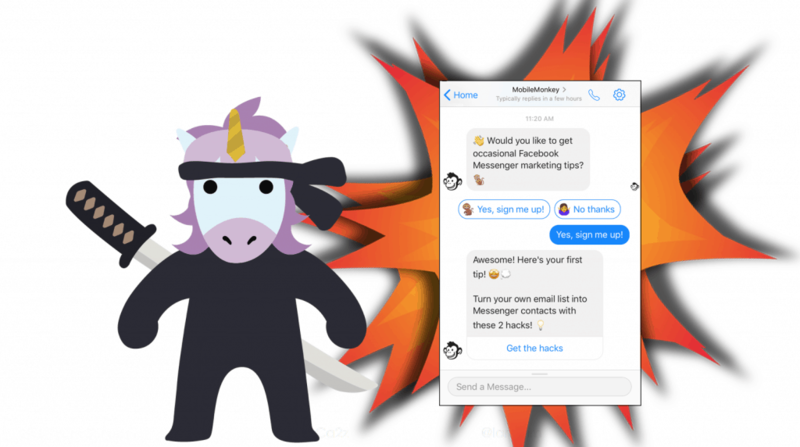 Mastering the Facebook Messenger subscription opt-in page is the first step in becoming a Messenger marketing ninja. 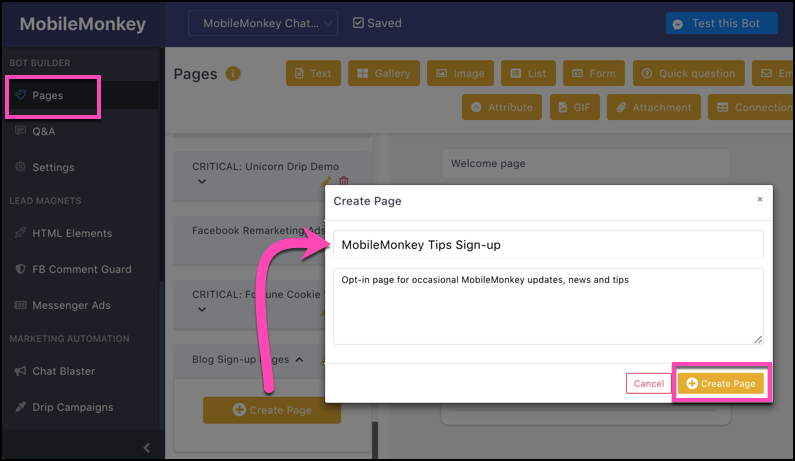 Today I’m going to zoom in on creating your Facebook Messenger opt-in pages in MobileMonkey. 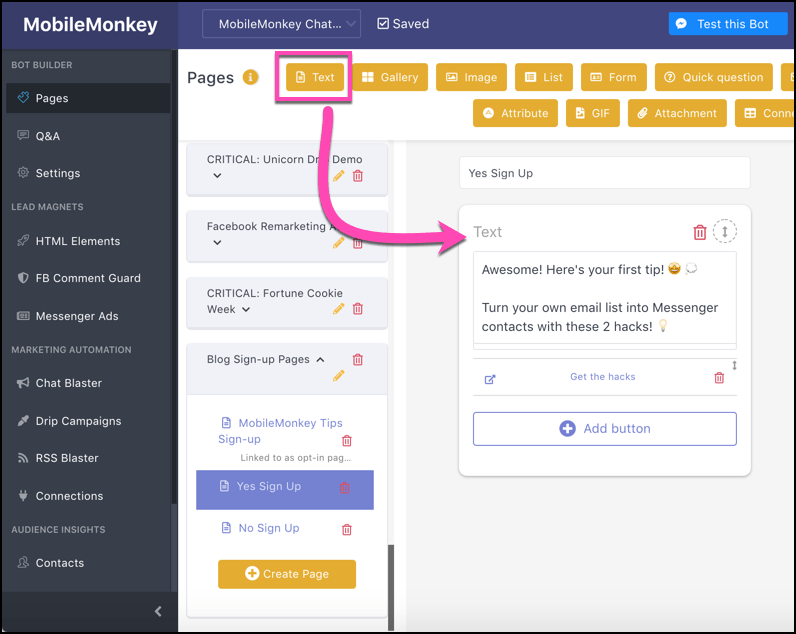 See a Facebook Messenger opt-in page in action by signing up for MobileMonkey Facebook Messenger updates, tutorials and news tips. 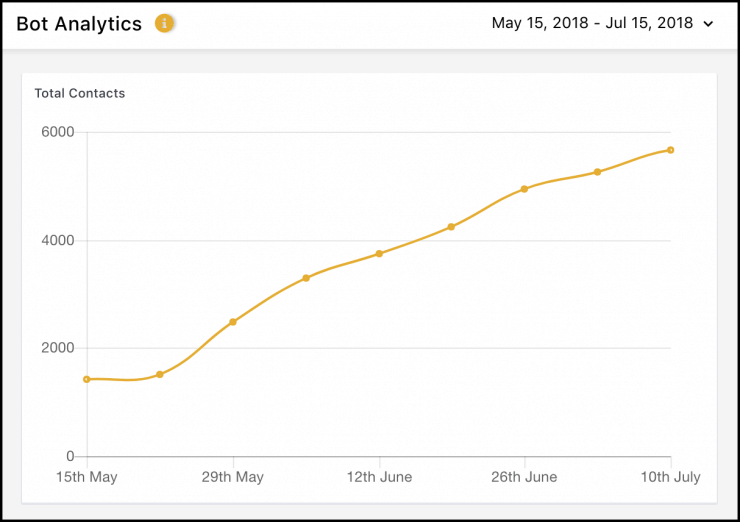 Here’s the three-step drill for building effective opt-in pages for Messenger subscriptions that get more sign-ups, let you segment your audience and send follow-up messaging. 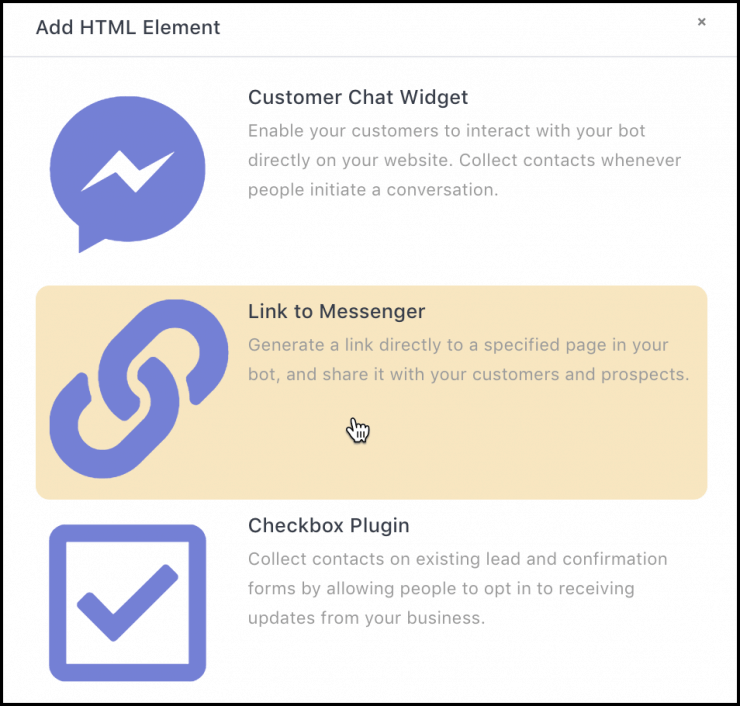 Use the visual chatbot builder to create chatbots without coding. Just click on the widgets to add content to your chat pages. And drag elements around to reorder them on your pages. Like folders on a website, groups help you keep your chat pages organized around their purpose. Some logical groups might hold all the chatbot pages around a single purpose, like sign-up pages. And you might create a group to hold all your blog update blasts. 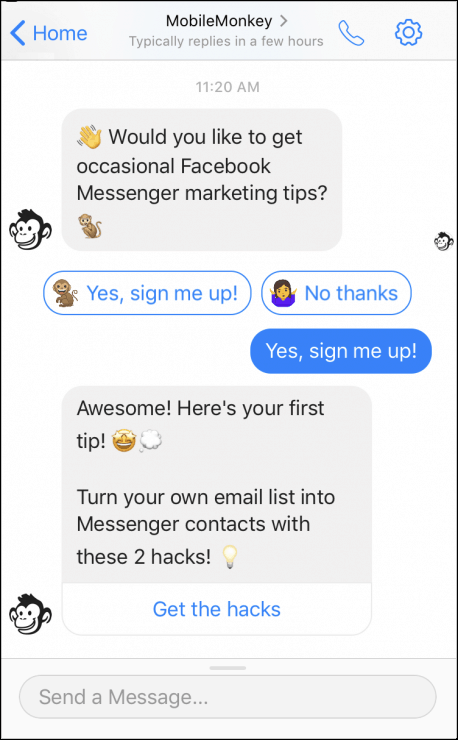 So to get started, go to the chatbot builder to create a Facebook Messenger opt-in page so people can sign up for updates from the MobileMonkey blog. 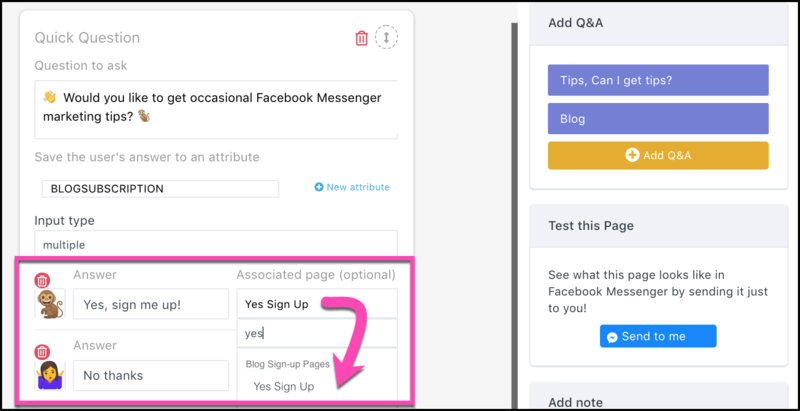 Create a new group for sign-up pages (webinar sign-ups, RSS subscription sign-ups, daily tip campaign sign-ups, etc.). 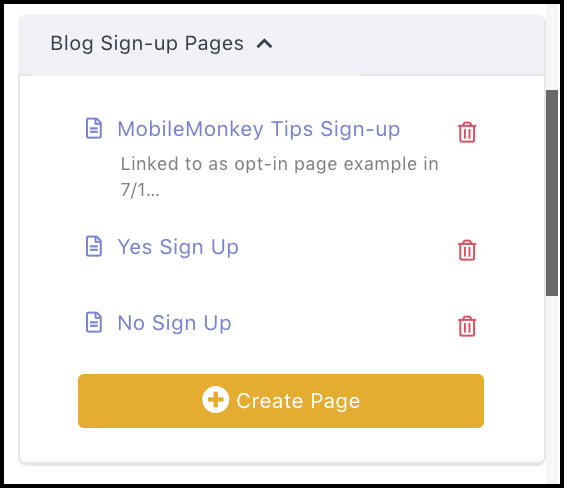 If you’re adding the new opt-in page to an existing group, go straight to creating a new page. 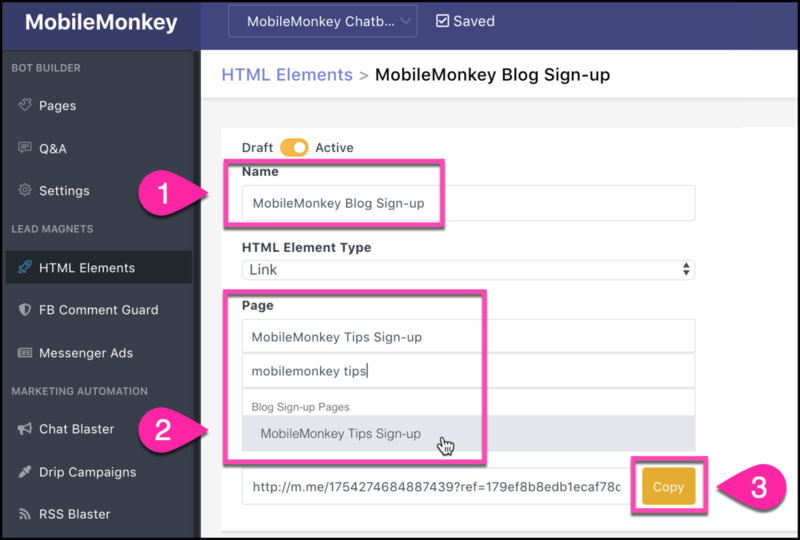 With your pages created, although blank, go back to the sign-up page to add content to the page. From “Input type” choose the option for “multiple” choice answers. User see multiple choices as buttons they can click to select. Answers are limited to 20 characters so they can fit in the button. Emojis are supported here! Repeat the process in the content editor to create the associated pages. These are the pages that result when a user clicks the “yes” and “no” buttons. 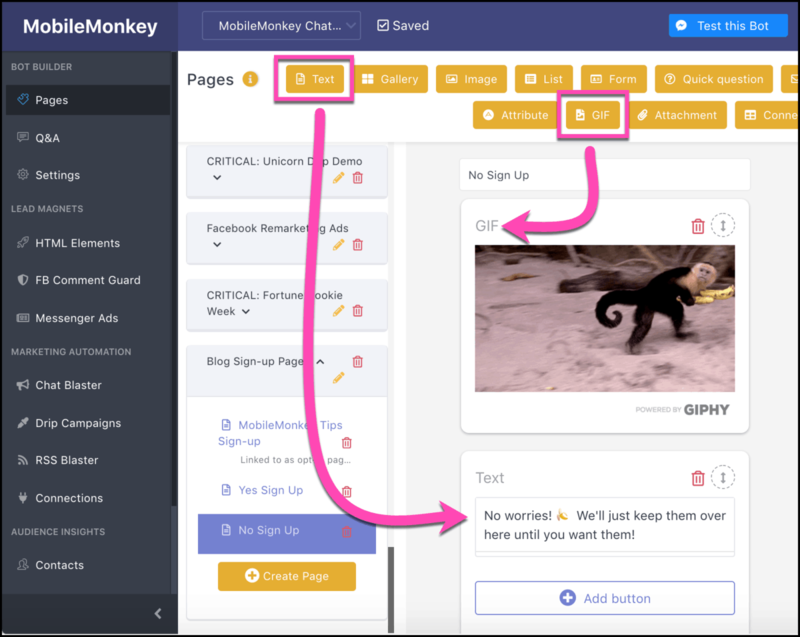 You won’t need to add triggers to these pages since users will only see them through interactions with other pages. Here’s what our Facebook Messenger opt-in confirmation pages look like. I like to give people a helpful resource for signing up right off the bat. You don’t actually need an associated page for any button, and you don’t need more than one button either. You can just use one “yes” button. 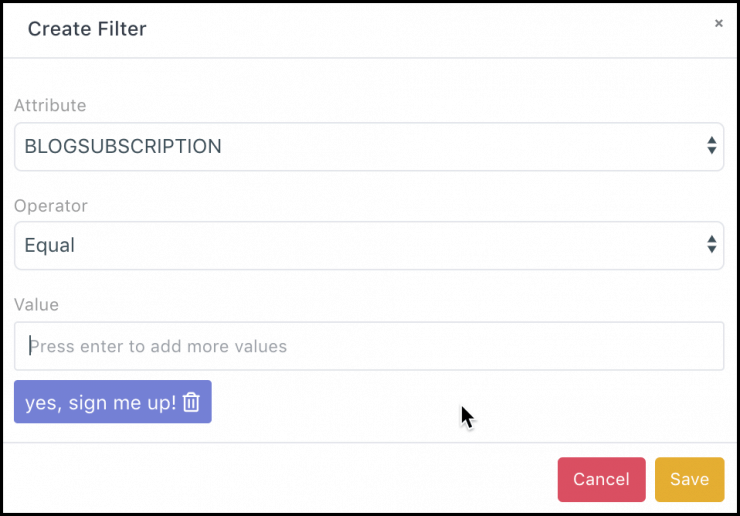 More tactics for your Facebook Messenger subscription opt-in pages and chat messages below. With your subscription opt-in page on-line, create a link so you can share it in all the usual spots. Share this link anywhere, everywhere! Blog posts, blasts in chat and email, social posts, signatures, you name it! 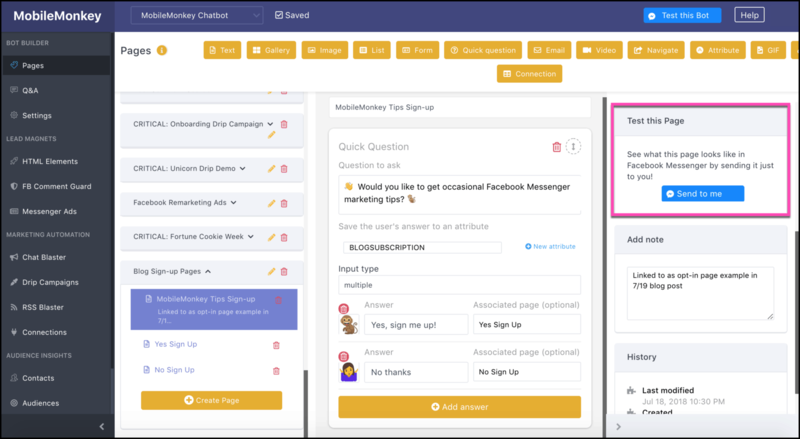 Like creating a list for your email marketing or an audience for your Facebook ad targeting, we create audiences for Messenger marketing. 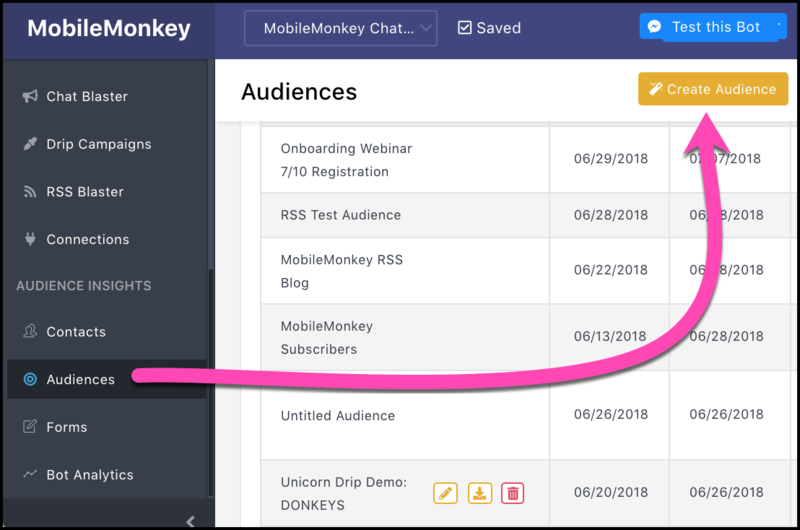 When you save this audience segment, you can create all the magical marketing automations — everything from Facebook Messenger chat blasts, to drip campaigns, to Facebook Messenger ads. 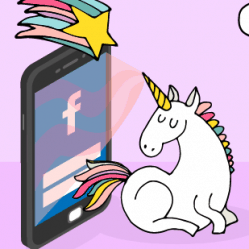 You’re probably going to be making a lot of Facebook Messenger subscription opt-in pages, so here’s your 5-point checklist for making them awesome. 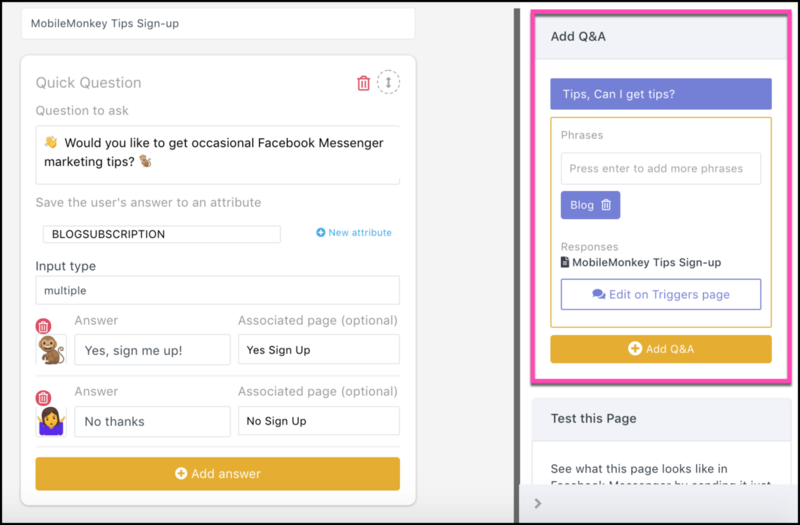 Quick question: Make your Facebook Messenger opt-in pages with the quick question widget. 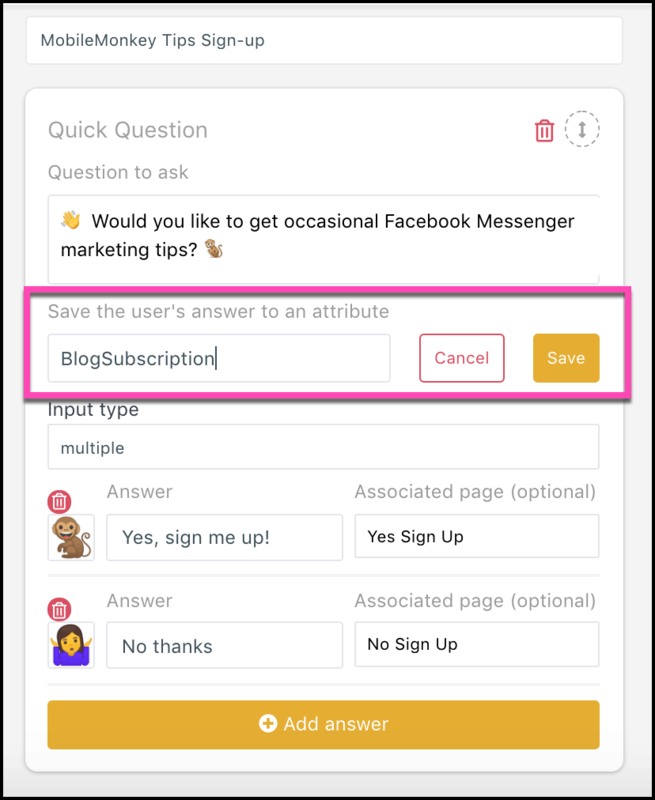 Attributes: Save an attribute to everyone who answers this question so you can create an audience segment for future messaging. Emojis: Since Messenger is a chat application, make your messages fit the normal chat etiquette. Emojis are the visual language of chat and text. Images: Use the images widget to add an image in the chat window, and don’t forget about the option to add an image next to buttons. Thank you page: The confirmation that they’ve opted in is your first chance to show they made the right choice in signing up. You can even provide valuable content right away in your thank you message. 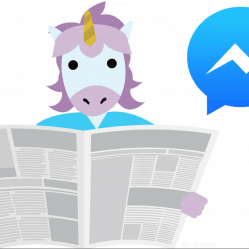 Check out our guide to Facebook Messenger marketing best practices for an up-to-date list on the rules for Facebook Messenger marketing straight from Facebook and our own experiences. 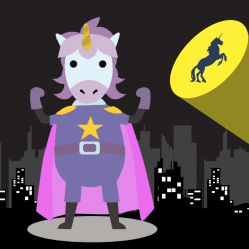 Get more Facebook Messenger tutorials and tips by signing up for MobileMonkey Facebook Messenger updates and see the unicorn ninja power of a Messenger opt-in page for yourself. 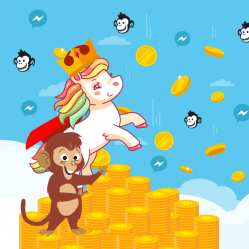 Join the MobileMonkey group on Facebook and share your ideas and questions. Hi Larry, If I am using Mobile Monkey to broadcast messages, do I still need to do as checklist 1? What if I didn’t do it before the expiry date or I create new page after expiry date, what will happened?